Blend organic coconut milk and cream in a blender or large mixing bowl. Pour the blended coconut cream and milk into three regular-size ice-cube trays. Leave in the freezer overnight. If you don’t have ice-cube trays, leave the cans in the freezer overnight. Add 1 tablespoon of hot water to 1 teaspoon of cherry Natural Calm and set aside. Cut the vanilla pod in two and scoop out the seeds and set aside. Remove the ice cube trays from the freezer and pop out. If you didn’t use ice-cube trays, leave the cans out for 10 minutes and scoop out the coconut milk/cream. If you’re scooping out of the can, you might need to loosen up the rim of the can to separate the coconut cream so it’s easier to scoop out, as it can stick to the edges. Add all the cubes to a food processor and blend for 5 minutes. If you have a small food processor, add the cubes in two batches. Add frozen cherries, maple syrup, cherry Natural Calm (mixed with water) and vanilla bean seeds to the food processor and blend for 2 minutes. Place in a tight-seal container in the fridge for an hour. Use an ice-cream scooper to scoop ice cream into small bowls. Any leftover ice cream can go back in the tight-seal container and be stored in the freezer for 3–4 days. The ice-cream will harden while in the freezer and needs to be left out for 5-15 minutes before re-serving. 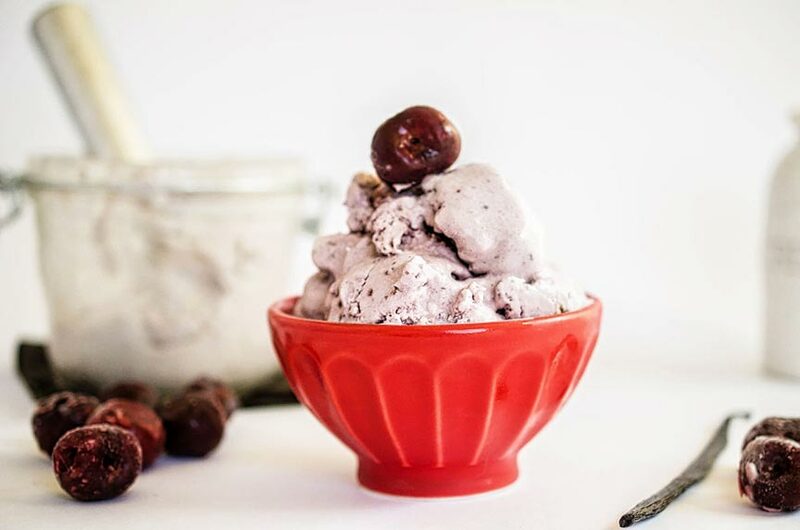 If you’d like to add cherry chunks to the ice cream, cut up ½ cup of frozen cherries and manually mix them into the ice cream until they spread evenly. This step can be done after step 7.